Who doesn’t like a tasty, heart-warming batch of chocolate chip cookies? The answer is gluten-intolerant people. Flour is one of the key ingredients in cookies and it contains gluten. Gluten is a kind of protein found in wheat and other types of grains. These days, gluten is on the radar of medical science as some people have gluten intolerance. Gluten is commonly found in grains like wheat, barley, rye, and spelt. It contains two proteins called glutenin and gliadin. Of the two proteins, gliadin is more responsible for the negative effects on the health. The number of people suffering from gluten intolerance has increased in recent years. However, that’s not to say that they cannot enjoy a good cookie. Nutritional science has found many alternatives to gluten-containing foods like almond flour, arrowroot flour, and buckwheat flour. 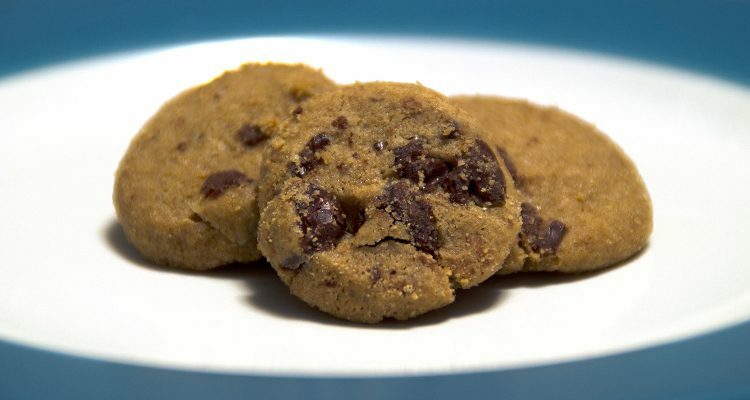 The flour used to make cookie dough can be replaced with gluten-free substitutes. Here are five delicious, gluten-free chocolate chip cookie recipes. Take a bowl and add almond flour, coconut flour, baking soda, and salt. Mix the ingredients well and make a nice dough. Next, add some almond butter, coconut sugar, coconut oil, one egg or chia egg, vanilla, and some dry mix. Blend them well with the dough. Add as much chocolate chips as you want. You can replace the chocolate chips with nuts as well. Make medium-sized, round balls and give them flat shapes. Line the baking sheet with parchment paper and put the uncooked cookies on it. Preheat the oven to 350°F. Put the baking sheet into the oven and bake for 10 minutes. The cookies should have a light golden color. In a large bowl, mash the banana and add peanut butter, egg, vanilla, baking soda, sugar, and salt. Stir well for a perfect blend. Add chocolate chips in the dough. On a parchment-lined baking sheet, drop big dollops of the dough, keeping a gap of 1 1/2” between two dough balls. Gently press on the balls of dough and put it in the oven. Let it cook in the oven for at least 10 minutes. Serve with a glass of milk or almond milk. Blend the butter with the brown sugar and caster sugar in a large mixing bowl. Add some vanilla extract to the mixture. Next, add flour, salt, and bicarbonate of soda (baking soda) to the mixture and mix well. Then, add the ground flaxseed and chocolate chunks to the mixture and make a good dough. Put spoonfuls of the dough on a greased baking tray and bake the flat dough balls in the oven. Bake them for eight to 10 minutes, or until golden brown. Put flour, baking soda and powder, and salt in a bowl and mix them well. Take another bowl, add the butter or coconut oil and sugar, and combine them perfectly. In the case coconut oil is used, make sure the the consistency isn’t too liquid or compact. Next, add an egg and vanilla extract. Whisk the entire mixture well. Then, add the flour mixture with the fat and sugar mixture. Be mindful of the consistency. Create the dough, and add chocolate chips and cocoa nibs. Wrap the dough in a plastic wrap and chill it for 30 minutes. Put heaping spoonfuls of dough on a parchment-lined baking tray. Bake the cookies for nine to 12 minutes, or until they are golden brown. Take a large mixing bowl. First, mix butter with sugar and mix them thoroughly well. Next, beat an egg and add vanilla extract into the mixture. Stir well. Then, add the baking soda, salt, and cocoa powder. Mix thoroughly to make the dough. Add chocolate pieces. Sprinkle some flaky salt on the dough. Wrap the dough with a plastic sheet and put in the fridge for sometime. Make small balls from the dough and shape them into cookies. Place the cookies on a greased baking sheet and bake in an oven which has been preheated to 350°F. Bake them for 15 minutes, or until browned.